The topic of food challenges is very personal to me. 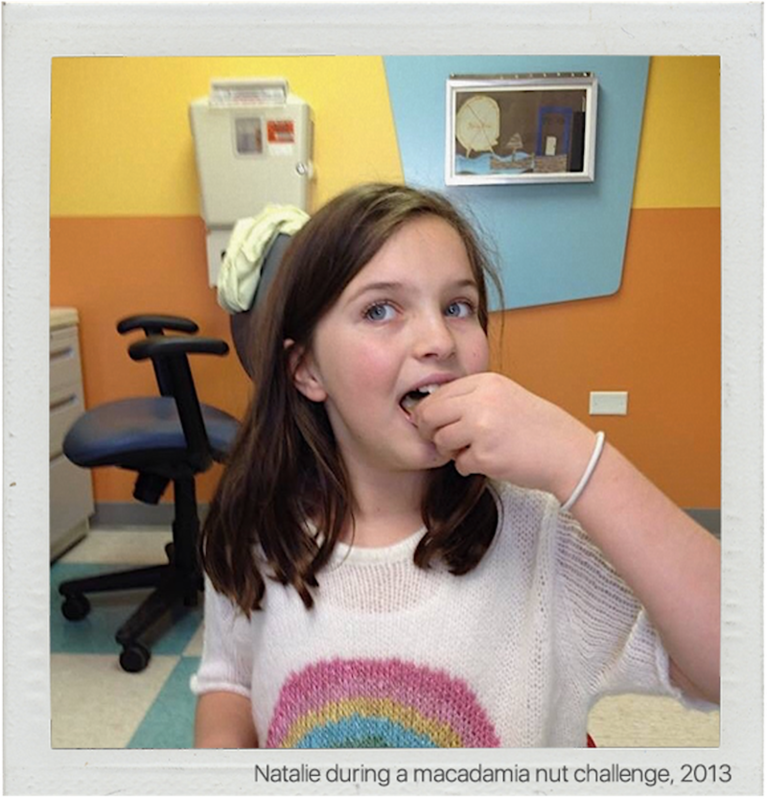 My 13-year-old daughter, Natalie, has multiple life-threatening food allergies and has experienced seven food challenges. She's passed five and has an upcoming appointment to face pecans for the third time after trying twice before (she doesn't like to say "failed"). In light of the recent devastating loss of a 3-year-old boy, we felt compelled to cover the topic. While the "how" that we are all searching for remains unknown, we have collected answers to the most common food challenge questions to move away from fear and take a step toward knowledge. Spokin's mission is to help people with food allergies live the fullest life possible. We want you to have that magic moment when you open our app and discover food allergy "wins" — wiping out the tremendous amount of time it takes to find safe food, restaurants, camps, etc. Our mission drives us to build a resource that is committed to, quite simply, life. The recent tragedies drive us to double down our efforts. If you have ideas of what you wish the Spokin app could do to make your life easier, please email me at susie@spokin.com. We are building Spokin for you and, near and dear to my heart, our kids. 1. What is an oral food challenge? 2. Why do a food challenge? 3. Reasons to not do a food challenge? 4. How does a food challenge compare to a blood test or a skin prick test? 5. How old does my child have to be to do a food challenge? 6. How do I prepare for a food challenge? 7. What do I bring to a food challenge? 8. Can you eat before the food challenge? 9. What actually happens during the test, who is monitoring and what are they looking for? 10. How long should you expect to be at the allergist’s office? 11. What happens if my child has a reaction during the challenge? 12. Who initiates a food challenge - parent or allergist? 13. How is a food challenge different from Oral Immunotherapy? 14. Can you test for multiple allergens at a time? 15. Why are baked milk and egg challenges different from cooked milk and egg challenges? 16. Are delayed reactions possible? 17. What does it mean if your child “passes” a food challenge? 19. If you pass one food challenge, are there related foods that might also be safe? 20. Are there any risks to food challenges? An oral food challenge is a highly-accurate test that determines if your child is allergic to a specific food. Considered the “gold standard” of allergy testing, a food challenge involves eating small but increasing amounts of food under close medical supervision to monitor any reactions. The ultimate goal is to consume a full serving of the food by the end of the session without any reactions. Good candidates for a food challenge have promising lab results from blood and skin prick tests, a less severe or distant history of anaphylaxis and/or a positive attitude toward the food challenge. If your IgE numbers (the number that measures the antibodies that trigger food allergy symptoms) are high or if your child was recently exposed to a food that caused anaphylaxis, your doctor will probably wait to do a food challenge. Seasonal allergies can also be a factor in when to do a challenge. For example, if your child is in the middle of their worst allergy season, there might be too many conflicting symptoms to get accurate results. It is also important to feel confident that your child will eat the food during the challenge as food anxiety can naturally play a role in the success of a challenge. Because the taste and texture of a new food can be uncomfortable or taste bad to your child, ask your allergist about adding to another safe food (i.e. putting peanut butter on an apple slice). 4. How does a food challenge compare to a blood test or skin prick test? Skin prick and blood tests are better at ruling out food allergies than diagnosing them. Because both skin prick and blood tests have a chance of showing a “false-positive” result, meaning your child might exhibit a reaction to the allergen but not actually be allergic, a food challenge result is always considered more accurate. During a skin prick test, the allergist drops a solution containing the allergen on your child’s skin then pricks or scratches the surface of to see if a reaction occurs. Blood tests measure the level of IgE antibodies to specific foods — the higher the IgE number, the greater the probability of a food allergy. Food challenges require actually ingesting and digesting the food protein, making them a better way to see how the immune system naturally responds to an allergen. Food challenges are part of the food allergy diagnostic process and have historically been considered safe for young children and infants under the appropriate medical supervision. After you make the appointment - Plan ahead. The tests can take between 4-6 hours depending on if your child has a reaction, so budget plenty of extra time. 5 days before - Stop taking antihistamines, which could mask any symptoms or reactions. Talk with your allergist about any medications your child is on that might interfere with the results of the challenge. The morning of the challenge - Your child must be in good health and have an empty stomach (see #8) to complete the food challenge. Other chronic conditions like asthma or eczema that commonly occur with food allergies must be controlled as their symptoms often mimic those of an allergic reaction. Challenge food. Parents are often responsible for bringing in the challenge food. It is very important to follow your allergist’s instructions and bring food that hasn't had contact with any other allergens your child may react to. Bring in the wrapper or properly prepare the food if required (i.e. baked milk or egg challenges). Plenty of distractions like toys, an iPad for movies, books, and games to keep your child busy as you will be in the office for several hours. Consider bringing a blanket to spread out on the floor if your child is too young to walk. Clear liquids and safe snacks for you and your child. He or she might be allowed to eat about an hour after the last dose. In some cases, allergists will allow the dose to be taken with other food like putting peanut butter on an apple slice. Be sure to discuss with your allergist before the challenge. Change of clothes in case your child gets sick. Usual and emergency medications for regular daily use on the way to the challenge or in case of a reaction. Talk with your allergist, but typically your child cannot eat anything for approximately four hours before the food challenge. In the morning before the test, clear liquids such as water, fruit juices without pulp, Gatorade and apple juice are allowed. The food challenge is typically conducted by a nurse and monitored by a physician. Before the test, your child will get a physical exam to make sure they are healthy enough to start the challenge. The nurse will check vitals and potentially do a lung function test, especially if your child has asthma. They might also do a skin test if necessary. The challenge typically involves 5-8 doses with 15-20 minutes in between each dose. The dose can be as little as a few milligrams for the first dose and is doubled with every subsequent dose. Vitals are taken before each dose, and your nurse will monitor for any symptoms of a reaction, but a good portion of the challenge will just be you and your child waiting and observing for any reaction. For patients with food protein-induced enterocolitis syndrome (FPIES), because the treatment for a reaction is not epinephrine but a quick dose of IV fluid, an IV line may be inserted during the challenge. After the final dose, your nurse will do another complete physical exam and will keep your child in the office between 30 minutes to 2 hours or more to ensure no reaction occurs. Food challenges can take between 3-6 hours to complete, but if your child has a severe reaction, they can take longer. However, if your child has a mild reaction early on in the challenge, it can be much shorter. If a reaction occurs, the challenge stops immediately and your child will be treated. For more mild cases, reactions can mimic symptoms of anxiety, but your nurse and doctor will be able to give advice throughout the process and help you determine whether your child is having a real reaction. Ultimately, you and your child are in control and can stop the challenge at any time. In severe cases, an IV may need to be administered for fluids or medication. This is more common for children with FPIES. In very rare cases, your child might require further observation in a hospital or emergency room. The decision to do a food challenge is made by you, your child and their allergy team — allergist, pediatrician, nurses, etc. Your allergist will typically begin the conversation and let you know if and when a food challenge is an option. Remember that challenges are not required and are completely voluntary. Some parents make the decision to wait for their child to get older, less anxious or for their IgE numbers to get lower, which is determined by a blood test. While a food challenge is a test to diagnose a food allergy, Oral Immunotherapy (OIT) is a type of treatment to desensitize patients to a particular food allergen. A food challenge takes place in one appointment and is routinely performed by most allergists, but OIT is only done by a few allergists in the country and takes place over a period of several weeks or months. No — in order to guarantee accurate results, only one food can be tested at a time. When the proteins in egg and milk are baked at 350 degrees for 30-35 minutes, compared to being cooked at a lower temperature, their structure changes in a way that the immune system might not recognize as harmful. Baked milk and egg challenges are a great way to learn more about the nuances of your child’s food allergy and can often help them work their way up to eating cooked egg. It is very rare for a reaction to occur after you complete the food challenge. In the event of a reaction, follow your emergency action plan to treat your child and call your allergist. Passing means your child is not allergic to the challenge food and can safely add it back into their diet. Your allergist will have a plan to incorporate the food back into your child’s routine. There can be a lot of pressure and anticipation that builds up around a food challenge. It is important to reframe the language of failure and make it clear to your child that the way the cells in their body react to food is not in their control. The real win is being brave enough to try the challenge in the first place. The immune system can have similar responses to foods that are "cross-reactive," which means they have similar protein structures and produce the same reactions. For example, there is a good chance that if you are allergic to cashew, you will also be allergic to pistachio. Similarly, if you pass the food challenge for cashew, there is a higher chance you may also be able to pass for a cross-reactive food like pistachio. Talk to your allergist about related allergens and how to set up future food challenges accordingly. There is always a chance your child will have an allergic reaction, and you will have to sign a waiver acknowledging any potentially severe risks, though they are extremely rare. The chance of a reaction depends on prior allergy test results, previous reactions and the severity and amount of time passed since the last reaction. Because the test is done in a controlled medical environment, food challenges are considered to be very safe for patients.